Making smarter policy and regulation is absolutely critical in today’s fast changing world. This change significantly impacts private sector development which underpins economic growth and living standards. More than ever, we need a better informed, faster way to make good policy and regulation, with business and government working effectively together to achieve best outcomes. Venturenauts is a specialist in adapting regulatory best practice strategies, systems and tools from around the world to suit local contexts and circumstances in developed and developing countries. Our core strength is our ability to work regionally across borders, at strategic and operational levels, understanding and adapting to different economies, business practices and cultures. Most countries have similar challenges and issues in terms of institutionalising, skill development, culture and commitment regulatory best practice to varying degrees. Its been a privilege to work on behalf of the ADB as team leaders and international consultants to design, implement and assist with RIA programs in multiple countries, working with senior executives in government, business and academia. Its a common misconception that smarter policy and regulatory development is the domain of governments. Common feedback we hear from governments in developing countries is the difficulty with getting the private sector and academia engagement in improving policy and regulatory development as constructive feedback is vital to good policy development as is good research and depth in capacity building. Conduct executive coaching and staff training programs to build regulatory management capability. Extensive experience in building the capability of organisations. We were honoured to have been invited by the Export Council of Australia to contribute an article about ASEAN for their International Business Trader, Winter 2017 edition. Our feature article “Right Approach to the Massive ASEAN Opportunity” discusses the opportunity that ASEAN represents, identifies the key challenges and shares some learnings on what we think is the right approach to engaging and doing business in the region. A full version of the article can found here. The Australia-ASEAN region is undergoing historic changes that impact businesses, especially SMEs, domestically and internationally. Landmark agreements such as the ASEAN Economic Community, Trans-Pacific Partnership, Regional Comprehensive Economic Partnership, AANZFTA and others, make it critical for Australian and ASEAN businesses to be informed and position themselves to benefit from the opportunities which these agreements present. Unprecedented world events like Brexit will also have a regional impact. Limited seating. Registrations close Monday 15 August 2016. Andrew Foo, SBGA, +61 439 891 628, sbgaust@gmail.com. We had the pleasure of attending a recent address titled ‘Keeping the Right Balance in Asia’ by the Hon John Howard OM AC, former Prime Minister of Australia. 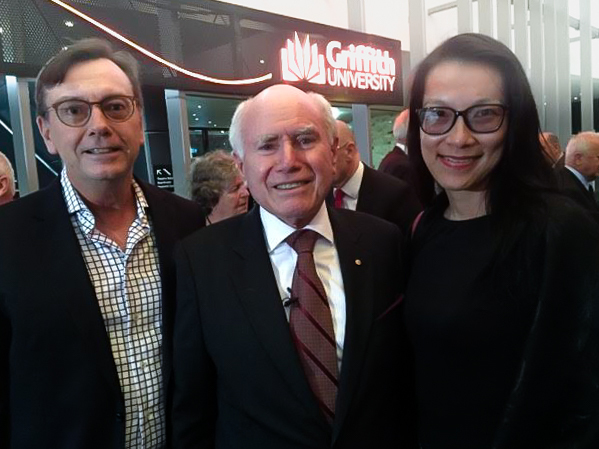 Mr Howard delivered the inaugural Asia Lecture at the Griffith Asia Institute, Griffith University in Brisbane Australia. Mr Howard discussed Australia’s emerging and evolving relationships across the Asian region including China and ASEAN. He shared the historic days in 2003 when US President George W Bush’s address to the Australian Parliament was followed the next day by the address of the President of the People’s Republic of China Hu Jintao. These events signalled Australia’s growing diplomatic position in the Asia Pacific to the world, and demonstrated there was no need to ‘choose friends’ between Australia’s traditional ties and its growing relationship with developing powers. Mr Howard observed that Australia was (and is still being) developed on the back of foreign investment, and that Australia should be open to foreign investment subject to the normal checks and balances. Good reminders as Australia seeks greater engagement and ties with its neighbours in the Asian Century. Venturenauts is honoured and privileged to be leading the Lao government’s project team implementing regulatory impact assessment (RIA) as part of legislation making and amending processes in Laos. At the recent meeting of the Lao Government RIA Task Force, chaired by the Vice Minister of Justice, H.E. Prof. Ket Kiettisak, Venturenauts’ Managing Director Peter McKenna gave an overview of the status, lessons and challenges with project implementation. The Task Force, consisting of senior officials from economic ministries across the Lao government and the Asian Development Bank, confirmed the importance of the RIA Project. RIA targets the removal and prevention of unintended consequences and unnecessary costs from legislation on businesses, reducing the cost of doing business in Laos and making Lao markets and businesses more productive and competitive, and fostering a business environment in Laos that is more attractive to local and international investors. Implementation of RIA in Laos is important and timely, given the country’s GDP growth targets, participation in the global economy, and commencement of the ASEAN Economic Community. If you are looking to do business in Asia, it’s not just about Japan, Korea, China or Indonesia. The ASEAN region is an exciting opportunity, being one of the world’s largest and fastest growing markets that sits right on our doorstep. 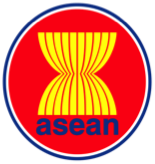 ASEAN member countries comprise Brunei Darussalam, Cambodia, Lao PDR, Indonesia, Malaysia, Myanmar, the Philippines, Singapore, Thailand and Vietnam. This diverse group has achieved incredible progress over the last 30 years, becoming an economic powerhouse in the region. 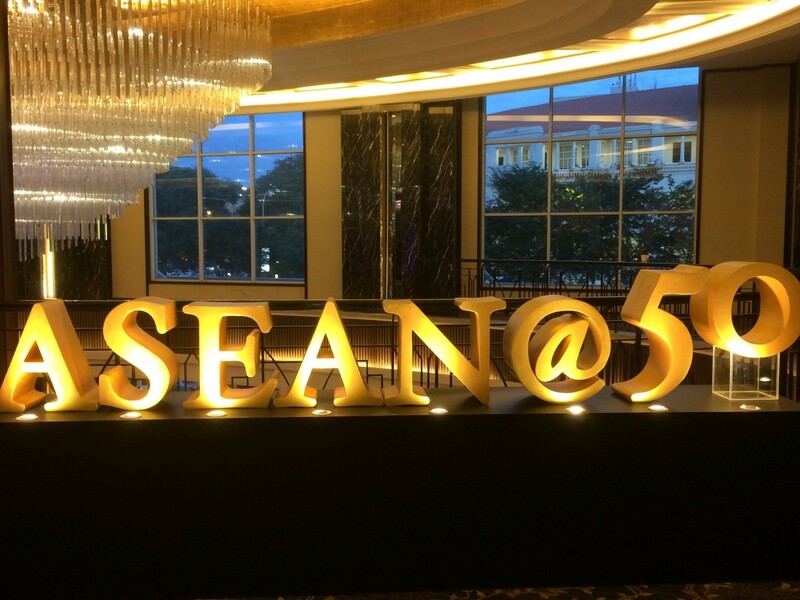 Collectively, ASEAN is the 7th largest economy in the world with a population over 600 million, a fast expanding middle class and GDP over US$ 2 trillion growing annually at around 5%. 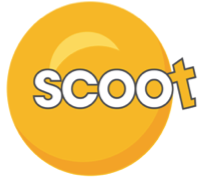 The full-version of this blog (and comments) was originally published in the First 5000 (a business network for Australia’s most significant mid-sized companies). 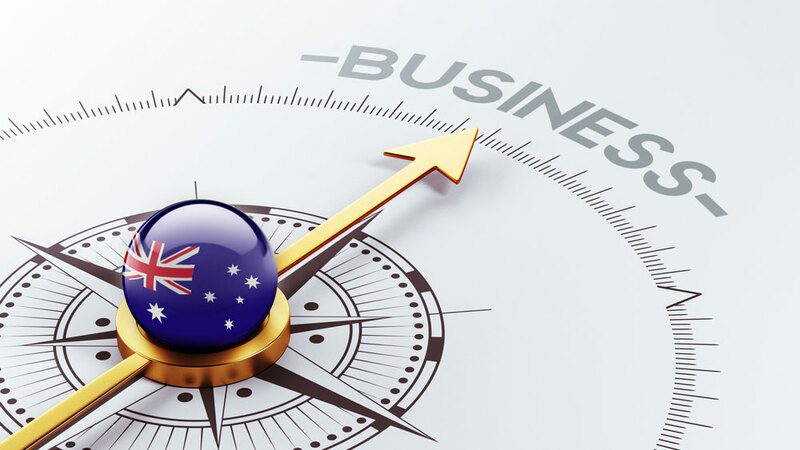 It outlines why Australian SMEs and investors should seriously consider an ASEAN business strategy, and looks at the attractions and challenges. Challenges include different cultures, business practices, languages and regulations across ASEAN, with individual countries differing in their level of market maturity. 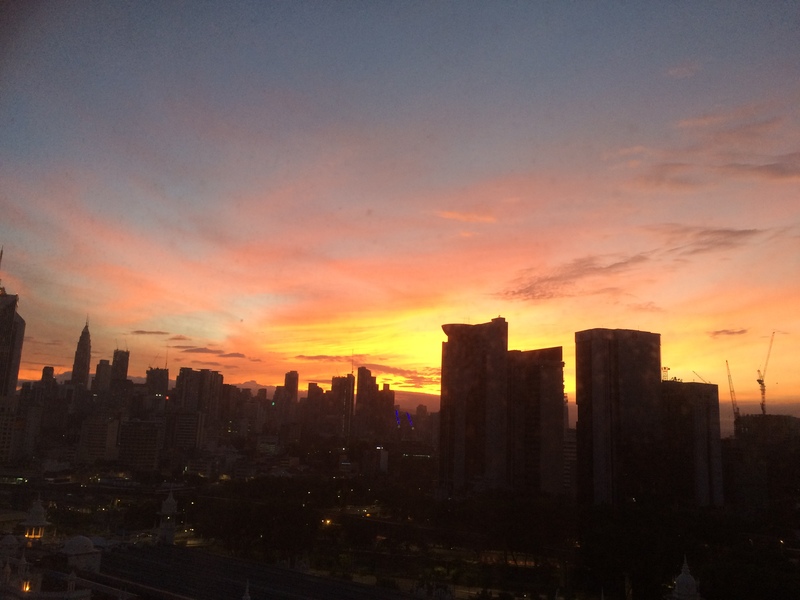 The blog concludes that Australian SMEs and investors have generally shied away from an ASEAN business strategy. 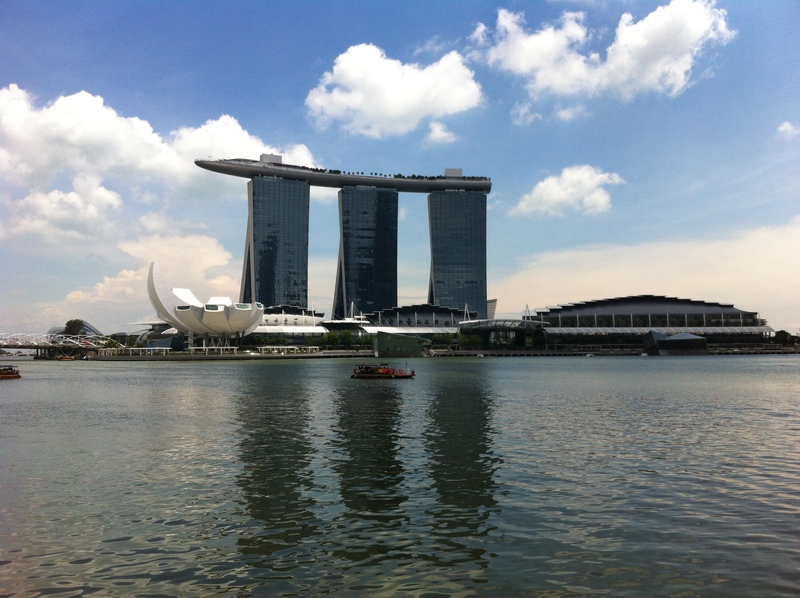 But now there is a lot of attractiveness about ASEAN, especially with the ASEAN Economic Community commencing in 2015. The return on investment is definitely tipping positive. It’s time to get ASEAN’d! 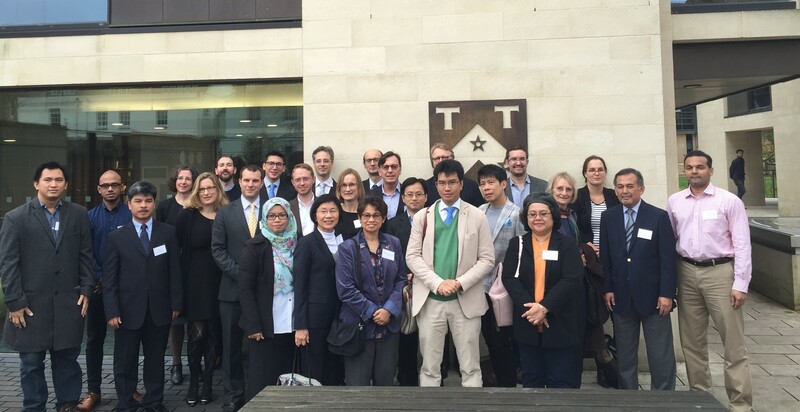 We are proud that Venturenauts’ Managing Director Peter McKenna was an invited expert speaker at the inaugural ASEAN Economic Integration Forum at University of Oxford’s St. Antony’s College on 10 November 2015. This forum marked the launch of the ASEAN Economic Community 2015 and was convened by the Asian Studies Centre at St Antony’s College, University of Oxford, the Institute of Malaysian and International Studies (IKMAS) at Universiti Kebangsaan Malaysia, and the World Trade Institute, University of Bern. 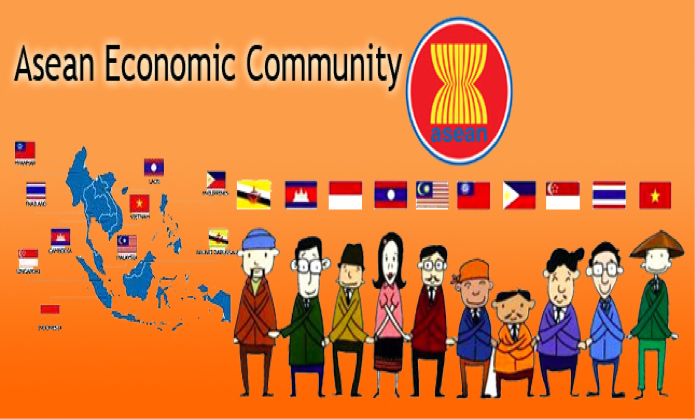 The main objectives of the ASEAN Economic Integration Forum 2015 were to discuss the economic governance challenges facing ASEAN Member States as they strive to establish the ASEAN Economic Community (AEC), and explore forward looking proposals to enhance the implementation of the ASEAN Economic Community 2025 objectives. New research and thinking was provided by speakers and hotly discussed amongst the Forum’s international participants. Cutting-edge perspectives were shared on topics ranging from the political economy of ASEAN’s member states to explain progress with the AEC, to examining the disparity, gaps, and openness in building connectedness (eg., production chains) across members states that unlocks the potential of ASEAN. 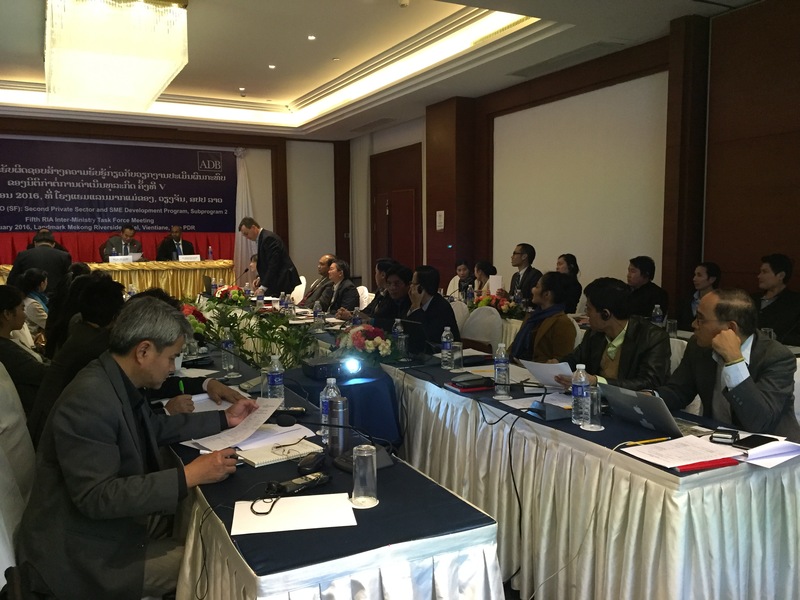 Co-Convenor of the Forum Associate Professor Dr Sufian Jusoh provided a very interesting and topical case study on integrating Myanmar into the AEC. Venturenauts’ Peter McKenna was privileged to be invited as the sole business speaker at the Forum. Peter’s presentation outlined the opportunities and challenges for business with the AEC from both an ASEAN and Australian business perspective, likely winners and losers, and detailed necessary collaborations that business needs with government and academia across ASEAN to make the AEC an business and economic success. Peter provided examples of collaborations that support SMEs which included raising awareness of ASEAN and the AEC across the community, developing international skills and knowledge in businesses and governments, training executives and officials in economic diplomacy, and addressing regulatory reform and harmonization at national and regional levels. This practical and strategic thinking resonated strongly with international participants. Planning for the ASEAN Integration Forum 2016 (proposed to be held in Malaysia) is commencing. Early expresssions of interest from partners, sponsors and interested supporters are being sought. If interested in learning more, please contact us. Great report about why Australia is a great place to invest and do business. 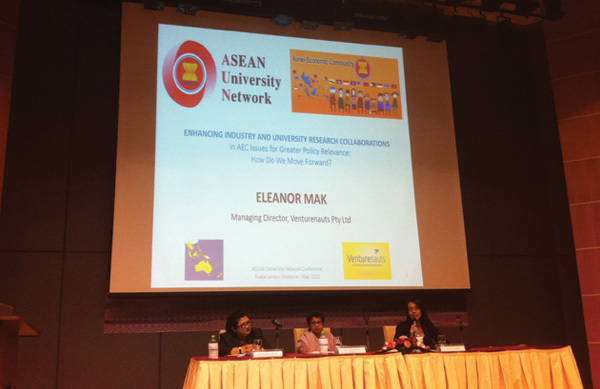 Invited speakers at the 2015 ASEAN University Network Conference (Malaysia) – spoke on implications of the coming Regional Comprehensive Economic Partnership on ASEAN and building Industry-University Collaborations.